Columban Sister Mary Thomas Chan died peacefully at the society’s retirement home at Magheramore in the county of Wicklow, Ireland, on 4 May 2014. 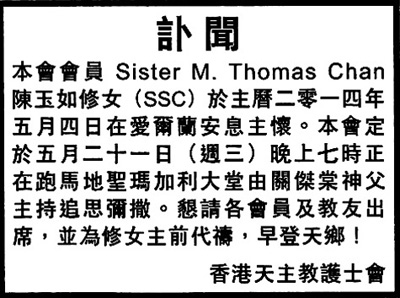 Hong Kong-born Sister Chan died on her 93rd birthday and is being mourned across the Columban world, as well as in the city of her birth, where as a Columban Sister she worked in the Ruttonjee Sanatorium, which specialized in the treatment and cure of the many people in the territory suffering from tuberculosis. Predeceased by her only brother, Henry Chan; she is fondly remembered by her surviving sister, Rose Tang, and her nephews, Sir David and Thomas; her two nieces, Peggy and Alice; as well as grandnieces and grandnephews, relatives and friends. Known as Fanny Chan in her younger days, she was educated by the Canossian Sisters and went on to study nursing at Queen Mary Hospital, coming out as a competent midwife and administrator, skills which served her well in her life as a Columban Missionary. From an early age she showed interest in the Catholic Church and was baptized in 1946. After which she joined the Legion of Mary, as well as being a committed member of the Catholic Nurses Guild. As a woman of prayer, she began to discern the call to the religious life and, as her faith in and love of God grew stronger, she made the decision to be part of a missionary community and joined the Columbans. This called for a big break from her family and friends, as she took the long boat trip to Ireland to begin her missionary formation. She returned to Hong Kong at the end of her novitiate and began work at Ruttonjee, where she filled various positions and, as a gifted teacher and administrator, empowered and inspired many nursing and medical students. She also used her culinary skills to great effect, instilling a passion for good nutrition for tuberculosis patients into the hospital staff. Those very same skills were later used at improving the daily fare at the Coulmban Sisters Motherhouse in Ireland and later at a large International Students’ Hostel in London, as well as a hospital visitor and bursar. To every challenge she took up, Sister Chan gave her wholehearted commitment, living out the motto she chose at her profession, Behold come to do your will. In later years, she returned to the city where her life and missionary career began to share her sensitivity and compassion with patients at the Prince of Wales Hospital in Shatin, but finally human frailty forced her back to the Columban Sisters Nursing Home in Ireland, where she lived out her remaining years in gratitude for the long and productive life God had gifted her with.